BEIRUT — U.S. Secretary of State Hillary Clinton flew to Beirut on Sunday to meet with Lebanese officials ahead of a critical election that could see a pro-American government ousted by the militant Shiite Muslim group Hezbollah and its allies. 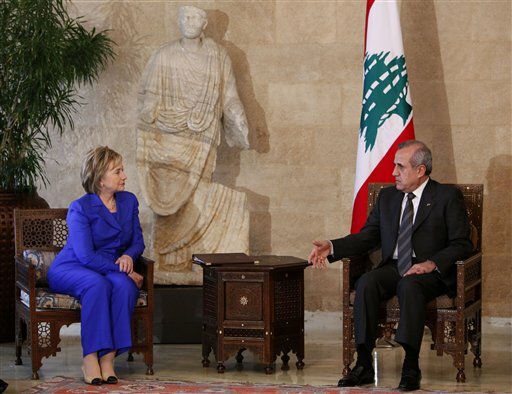 Clinton arrived unannounced in Lebanon a day after a similarly secret trip to Iraq to show support for the country’s fragile democracy before the June 7 vote. Hezbollah is gaining strength and some fear turmoil if it wins enough votes to play a dominant role in a coalition. A strong showing by Hezbollah might also see its sponsors Iran and Syria gaining influence in the region and harming Arab-Israeli peace efforts. The U.S. and Israel regard Hezbollah as a terrorist organization, although it plays a role in Lebanon’s current government. “Beyond the elections we will continue to support the voices of moderation in Lebanon and the responsible institutions of the Lebanese state they are working hard to build. Our ongoing support for the Lebanese armed forces remains a pillar of our bilateral co-operation,” she said. Prior to Clinton’s visit, the U.S. ambassador to Lebanon had already expressed concern about the election, and Hezbollah’s opponents warn the consequence may be the West isolating the country and Washington reducing millions in aid. The Obama administration is urging free and fair elections but is treading carefully. The Bush administration encouraged the Palestinian legislative elections in 2006 and then saw the radical Hamas movement win handily and badly damage efforts to broker an Israeli-Palestinian peace deal. 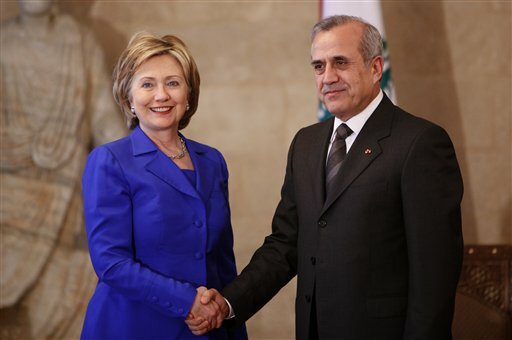 Reflecting that concern, Clinton was expected to stay only briefly in Beirut and meet with just one senior official, President Michel Suleiman. She was not expected to see other politicians who will be candidates in the election, like the pro-Western Prime Minister Fuad Saniora. 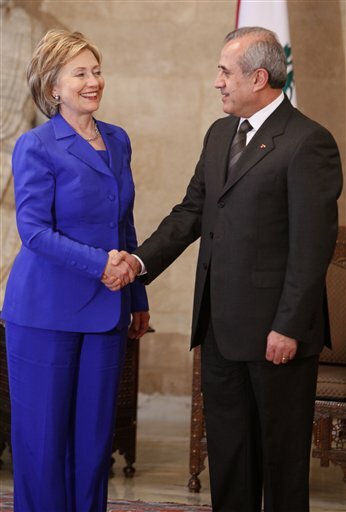 Clinton to Iraqis: US not going to abandon you. 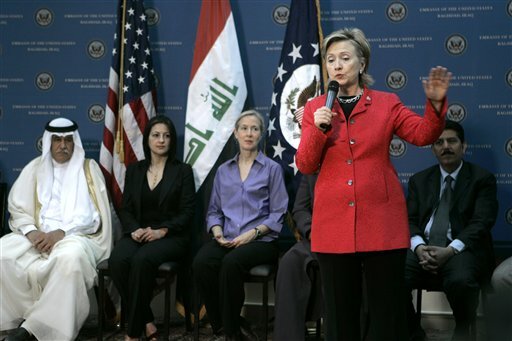 BAGHDAD (AP) — U.S. Secretary of State Hillary Rodham Clinton sought to assure Iraqis on Saturday that the Obama administration would not abandon their country even as it presses ahead with plans to withdraw American troops amid a recent surge in violence. Clinton said the drawdown would be handled in a “responsible and careful way” and would not affect efforts to improve Iraq’s security forces, or complete reconstruction and development projects. “Let me assure you and repeat what President Obama said, we are committed to Iraq, we want to see a stable, sovereign, self-reliant Iraq,” she told a nervous but receptive crowd at a town hall meeting at the U.S. Embassy in the capital. “We are very committed, but the nature of our commitment may look somewhat different because we are going to be withdrawing our combat troops over the next couple of years,” Clinton said. On her first trip to Iraq as America’s top diplomat, Clinton said the country has made great strides despite a recent surge in violence. High-profile attacks this past week primarily targeted Shiite worshippers. More than 150 people, many of them Iranian pilgrims, have died. Ahead of her arrival, Clinton said the attacks are a sign that extremists are afraid the Iraqi government is succeeding. “I think that these suicide bombings … are unfortunately, in a tragic way, a signal that the rejectionists fear that Iraq is going in the right direction,” Clinton told reporters aboard her plane. The Pentagon plans to hand over responsibility for most urban security in about three months as part of the administration’s goal of a complete exit of forces by the end of 2011. U.S. officials say they remain committed to a June 30 deadline to move all forces outside major cities, including Baghdad. But the top U.S. commander in Iraq, Gen. Raymond Odierno, has said American troops could “maintain a presence” in some cities if requested by the Iraqis. “Frankly, some people are afraid,” said one participant in the town hall who said many questioned the ability, competence and neutrality of Iraq’s security forces, given the U.S. withdrawal plan. “We will be working closely with the Iraqi government and the Iraqi security forces as we withdraw our combat troops, but we need to be sure that all of you are supporting a strong, nonsectarian security force and we will work to try and help make that happen,” she said. Clinton was met at the airport by the chairman of the U.S. Joint Chiefs of Staff Adm. Mike Mullen and the new U.S. ambassador in Baghdad, Christopher Hill. By trying to talk Iran out of its nuclear program, the U.S. is in a better position to organize tougher international sanctions in the event that diplomacy fails, Secretary of State Hillary Rodham Clinton said Wednesday. “We actually believe that by following the diplomatic path we are on, we gain credibility and influence with a number of nations who would have to participate in order to make the sanctions regime as tight and as crippling as we would want it to be,” Clinton told the House Foreign Affairs Committee. Iran denies that its nuclear program is intended to develop weapons. The official Iranian news agency IRNA reported Wednesday that Iran welcomes a “constructive” dialogue with world powers over its nuclear program, but insisted that it won’t halt its uranium enrichment activities. The Iranian report was in response to an invitation from the United States, Britain, China, France, Germany and Russia for a new round of nuclear talks. No date has been set. 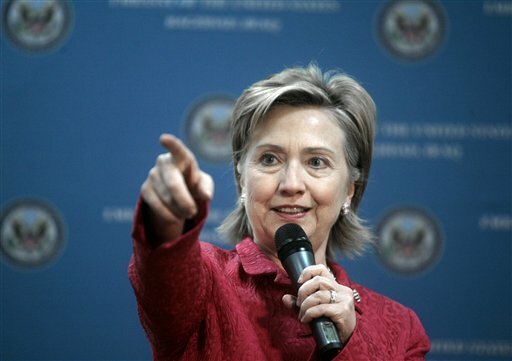 Clinton said Iran and its nuclear program are one of the administration’s highest foreign policy priorities. “We are deploying new approaches to the threat posed by Iran and we’re doing so with our eyes wide open and with no illusions,” she said. “We know the imperative of preventing Iran from obtaining nuclear weapons,” she added. “After years during which the United States basically sat on the sidelines, we are now a full partner” in international talks on Iran. The committee chairman, Rep. Howard Berman, D-Calif., asked Clinton how much time it would take to get results on Iran. She did not reply directly but said the administration believes it has set the stage for progress by interacting more directly with allies and by reaching out to the Iranian authorities. “It is going to be a more successful engagement if our partners around the world understand they must work with us,” including on consultations aimed at imposing tougher sanctions on Iran, Clinton said. In her opening remarks to the panel, Clinton said the core goal of President Barack Obama’s anti-terror strategy is to defeat al-Qaida and prevent its return to Afghanistan. Berman said the panel is concerned about Islamic extremists gaining momentum in Pakistan. The California Democrat said the U.S. cannot allow the extremists to take over Pakistan or to operate with impunity on Afghanistan’s border. Clinton asserted in response that the international community is working closely together to address the problem of extremism in both Afghanistan and Pakistan. SECRETARY CLINTON: Good morning, everyone. I cannot tell you how happy I am to welcome a colleague and a new friend to the State Department. It is always wonderful working with our Dutch allies on a range of issues. And as many of you know, the foreign minister scheduled and pulled off the meeting we had in The Hague about Afghanistan in just a record period of time. Minister Verhagen is someone who takes so seriously the range of issues that not only concern our two countries, but indeed our concerns about the world. We have just discussed a wide range of issues and set up a process that will continue going forward so that we can get in depth on a number of important matters. I told the minister that unfortunately, I have to leave to attend to my first Cabinet meeting, which was scheduled long after we had set this time aside for our meeting. But we were able to touch on everything from piracy to the situation in Afghanistan and Pakistan, and last but not least, the commemoration of the 400th anniversary of Henry Hudson’s voyage to the New World, which has particular interest to me as a New Yorker. I want to just quickly mention a few of the matters that we discussed. Obviously, piracy is a concern to both our countries and indeed to the world. And I want to thank the Netherlands for the work they have done to fight piracy off the coast of Somalia, including their recent successful mission over the weekend to free 20 Yemenis, whose fishing vessel was hijacked by the pirates. Dutch ships and aircraft have been instrumental in the interdiction of pirates and the prevention of capture for ransom of several ships. We look forward to continued cooperation. And we’re going to work together to seek more effective ways to hold these pirate criminals accountable for their actions, which threaten not only the lives of merchant seamen and the vessels on which they sail, but the security of critical maritime routes. To this end, we will work on clarifying the legal authorities that exist. There will be, at our request, a meeting of the international piracy contact group in New York City in early May, in addition to the meeting that will be held shortly in Brussels. We’re going to have to determine the best way to bring pirates to justice after they’re captured. And there will have to be additional discussion about this at NATO as well. I appreciate very much the foreign minister’s extraordinary work in highlighting the necessity for us to be effective in our efforts in Afghanistan that came out of the conference in The Hague. You know, the Dutch contributions in Uruzgan province have been instrumental and a real model in showing how we can bring stability and security to the people of Afghanistan. Dutch soldiers and civilians have done excellent work. In fact, the Dutch “3D” approach – defense, diplomacy, and development – pursued simultaneously, which may sound familiar to some of us, is a model for our own efforts and the future efforts in Afghanistan. There’s a lot of work for us to do there, and the minister will be meeting with Ambassador Holbrooke as well to go into greater depth. SECRETARY CLINTON: Thank you so much. Thank you, Rodolfo Espinal. I appreciate very much your serving as our moderator today. This is an exciting venture here at FUNGLODE, the Global Democracy and Development Foundation, which is hosting us in Santo Domingo. We are connected online from Brazil and Peru to Mexico, Jamaica, and far beyond even our hemisphere. I am personally honored that President Fernandez is here with us. I’ve had an excellent series of discussions with the president and his ministers. I’m also delighted that Margarita is here as well. I have known Leonel and Margarita for many years. We were – he was very young and I was younger. (Laughter.) And it is a pleasure to be with him. I also want to thank your foreign minister. Carlos, thank you for your hospitality and the great cooperation that we have. And again, Monsignor Nuñez, who I was with earlier from the Pontificia Catholic University, mother and teacher for the excellent education leadership, and the Minister of Education, with whom I toured the Rosa Duarte School. This digital town hall seems particularly fitting to hold here in the Dominican Republic on the eve of the Summit of the Americas in Trinidad and Tobago. Here in the Dominican Republic, I feel very much at home. We are linked by geography and history, by common values and cultural heritage. And now, we are finding new and innovative ways to engage one another, expand our dialogue, create new partnerships, solve the problems that we face together. As someone who had the great honor of spending eight years representing New York in the United States Senate, I feel very close to this part of our world. And in particular, I think of the Avenue of the Americas in the middle of New York City. It has monuments honoring Latin American leaders, a square named for Juan Pablo Duarte, the great Dominican who helped this nation achieve its independence and whose sister, by the way, Rosa, started the school that I visited earlier. The following statement was made today at a press availability with Haitian Prime Minister Michele Duvivier Pierre-Louis after their meeting. SECRETARY CLINTON: But before I turn to the important issues that we discussed today about Haiti, I’d like to take a moment to discuss an issue that affects us all, and that is the scourge of piracy. The attempted capture of the Maersk Alabama and the attack yesterday on the Liberty Sun off the coast of Somalia are just the most recent reminders that we have to act swiftly and decisively to combat this threat. These pirates are criminals. They are armed gangs on the sea. And those plotting attacks must be stopped, and those who have carried them out must be brought to justice. Last weekend, we were all inspired by the courage and heroism of Captain Phillips and his crew, and by the bravery and skill of the U.S. Navy. These men are examples of the best that America has to offer. And I salute and thank them. But now it falls to us to ensure that others are not put into a similar situation. As I said last week, we may be dealing with a 17th century crime, but we need to bring 21st century solutions to bear. I want to commend the work that this Department’s anti-piracy task force has already done, along with their counterparts throughout our government. In the past several months, we have seen the passage of a robust United Nations Security Council resolution, a multinational naval deployment, improved judicial cooperation with maritime states and an American-led creation of a 30-plus member International Contact Group to coordinate our efforts. But we all know more must be done. The State Department is actively engaged with the White House and other agencies in pursuing counter-piracy efforts, both unilaterally and in concert with the international community. This Friday, a steering group that includes State, the Department of Defense, the Department of Justice, the Department of Transportation, the Department of Homeland Security, and the intelligence community, will meet to consider recent events and potential responses. This week, the State Department is taking four immediate steps as we move forward with a broader counter-piracy strategy. But let me underscore this point: The United States does not make concessions or ransom payments to pirates. What we will do is first send an envoy to attend the international Somali peacekeeping and development meeting scheduled in Brussels. The solution to Somali piracy includes improved Somali capacity to police their own territory. Our envoy will work with other partners to help the Somalis assist us in cracking down on pirate bases and in decreasing incentives for young Somali men to engage in piracy. Second, I’m calling for immediate meetings with our partners in the International Contact Group on Piracy to develop an expanded multinational response. The response that came to our original request through the Contact Group for nations to contribute naval vessels has turned out to be very successful. But now we need better coordination. This is a huge expanse of ocean, four times the size of Texas, so we have to be able to work together to avoid the pirates. We also need to secure the release of ships currently being held and their crews, and explore tracking and freezing pirate assets. Third, I’ve tasked a diplomatic team to engage with Somali Government officials from the Transitional Federal Government as well as regional leaders in Puntland. We will press these leaders to take action against pirates operating from bases within their territories. And fourth, because it is clear that defending against piracy must be the joint responsibility of governments and the shipping industry, I have directed our team to work with shippers and the insurance industry to address gaps in their self-defense measures. So we will be working on these actions as well as continuing to develop a long-term strategy to restore maritime security to the Horn of Africa. Well, thank you very much, and I congratulate the IDB, President Moreno and the staff for hosting this important donors conference. I thank Secretary General Ban Ki-moon not only for the United Nations commitment, but your personal commitment with the recent trip that you took with my husband to Haiti. And I congratulate the prime minister for an excellent plan that was laid out and clearly explained, and now presented to all of us. And to Minister Oda, thank you and your government for linking the aid that we hope comes from this donors conference with the effectiveness that needs to be present. Now, for some of us, Haiti is a neighbor, and for others of us, it is a place of historic and cultural ties. But for all of us, it is now a test of resolve and commitment. Now, some may ask, and I am sure there are some in my country and my Congress who may ask, why a small nation in the middle of the Caribbean should command so much attention. Why should countries in the Western Hemisphere, Europe, the Middle East and Asia offer assistance to Haiti in the midst of a global economic downturn (inaudible)? And I think the answer is very clear. Because what happens in Haiti affects far beyond the Caribbean and even the region. This small nation of 9 million people is on a brink. It is on a brink of either moving forward with the help of the collective community or falling further back. And it, as well as this region, will be shaped to a large extent by the decisions that we make. On a personal note, my husband and I went to Haiti for the first time shortly after we were married, so we have a deep commitment to Haiti and the people of Haiti. Our homes are filled with art from Haiti. We have friends who hail from Haiti. But it is not only my personal concern that brings me here today. On behalf of the United States, we are here because Haiti is a neighbor and a friend. Our ties reach back to the early years of both of our nations. They have endured for generations, through our struggles for independence, through the defeat of slavery in Haiti which inspired slaves and abolitionists in my country, to the hundreds of thousands of Haitians who have emigrated to the United States and have strengthened us through their contributions in politics and business and health and education, in science, sports, and culture – the benefits of which I experienced firsthand as a senator representing New York, which has a vibrant Haitian American community. SECRETARY CLINTON: Good afternoon. I am so delighted to extend a warm welcome to the prime minister of Haiti and to her distinguished delegation. She and I were together at the donors conference on behalf of Haiti yesterday. And as you know, I will be traveling to Haiti tomorrow. But before I turn to the important issues that we discussed today about Haiti, I’d like to take a moment to discuss an issue that affects us all, and that is the scourge of piracy. The attempted capture of the Maersk Alabama and the attack yesterday on the Liberty Sun off the coast of Somalia are just the most recent reminders that we have to act swiftly and decisively to combat this threat. These pirates are criminals. They are armed gangs on the sea. And those plotting attacks must be stopped, and those who have carried them out must be brought to justice. 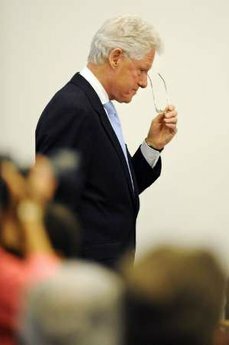 Former U.S. President Bill Clinton concludes his remarks to the Haiti Donors Conference at the Inter-American Development Bank in Washington April 14, 2009. 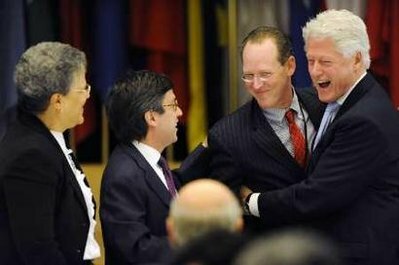 Paul Farmer (2nd R), co-founder of Partners In Health and board member of the Institute for Justice & Democracy in Haiti, laughs with former U.S. President Bill Clinton (R) at the Haiti Donors Conference at the Inter-American Development Bank in Washington, April 14, 2009. Also pictured are Inter-American Development Bank President Luis Alberto Moreno (2nd L) and Haiti's Prime Minister Michele Duvivier Pierre-Louis (L). 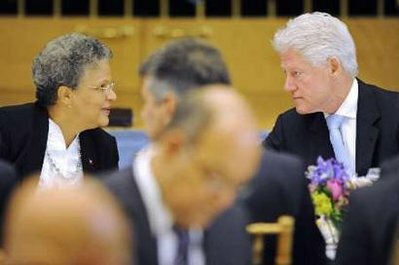 Haiti's Prime Minister Michele Duvivier Pierre-Louis (L) speaks with former U.S. President Bill Clinton at the Haiti Donors Conference at the Inter-American Development Bank in Washington April 14, 2009. WASHINGTON, Apr 15 (IPS) – International donors have pledged 324 million dollars over the next two years in additional aid to help Haiti recover from food riots and damage to roads and other key infrastructure caused by four hurricanes that ravaged Latin America’s poorest nation last summer.The commitments were made during an all-day, all-star meeting that featured former U.S. President Bill Clinton, his wife and current secretary of state, Hillary Clinton, U.N. Secretary-General Ban Ki-moon, and the heads of the World Bank and International Monetary Fund (IMF), among others, at the headquarters of the Inter-American Development Bank (IDB) here Tuesday. The new commitments, including 41 million dollars to reduce the government’s anticipated deficit this year, came amid growing concern that Haiti’s economy faces daunting challenges not only in recovering from the hurricanes that effectively erased 15 percent of its gross domestic product (GDP) last year, but also in coping with the global financial crisis which, among other effects, has reduced remittances to Haiti from the U.S.
For the first time in several decades, the economy’s growth in 2007 – 3.4 percent – exceeded the increase in its population. But the hurricanes, which hit the country’s third-largest city, Gonaives, particularly hard, more than reversed the advances of the previous year. Losses were estimated at some one billion dollars, while more than 800 people were killed by the flooding and tens of thousands were displaced from their homes. Just last month, the Brussels-based International Crisis Group (ICG) warned that serious instability could ensue if donors failed to sharply increase their assistance in the wake of last April’s food riots, which resulted in the ouster of the then-Prime Minister Jacques-Edouard Alexis, and the following summer’s hurricanes. “The socio-economic situation is worse than at the time of the April 2008 riots and the fall of the Alexis government,” said Bernice Robertson, the group’s senior Haiti expert, when the report was released in early March. 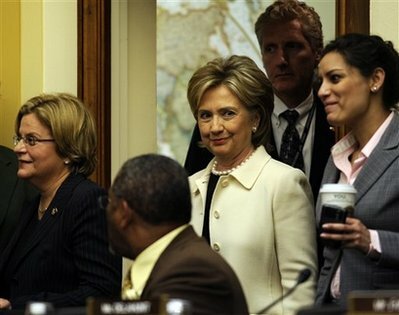 Clinton said Washington will provide 287 million dollars in non-emergency to Haiti this year, most of which will be devoted to infrastructure, agricultural development, debt relief, and security, which, despite the natural disasters, has improved sharply over the last several years due largely to the efforts of the Brazilian-led U.N. 9,000-strong peacekeeping force, MINUSTAH. In addition to aid, Washington has provided Haiti with duty- and quota-free treatment to Haitian garment exports guaranteed over 10 years under its Haitian Hemispheric Opportunity through Partnership Encouragement (HOPE II) Act of 2006. Development economist Paul Collier, who has acted as Ban’s special adviser on Haiti, has praised HOPE II as “best trade deal on earth” and one that could, given needed investments in energy and infrastructure, create tens of thousands of jobs in a country where unemployment is estimated at 70 percent and some one million young people are expected to enter the job market over the next five years. In addition, Haiti is on track to meet the conditions for gaining one billion dollars in debt relief from the IDB, the IMF, and the World Bank as early as the end of June. IMF Managing Director Dominique Strauss-Kahn said debt cancellation would free up to 48 million dollars a year for projects to reduce poverty and promote economic growth. Clinton, whose intervention in Haiti in 1994 resulted in the restoration of civilian rule and whose foundation supports a number of projects there, echoed that view in the conference keynote address. “Haiti’s got a chance, the best chance in my lifetime,” he said. “Haiti has good leaders. Haiti has a good plan, only you can give them the capacity to do it,” he told the donors. The Haitian government is hoping that President Barack Obama will yield to appeals by Preval and Duvivier-Louis to grant “temporary protected status” (TPS) to tens of thousands of undocumented Haitians – as it has done for Central Americans after natural disasters. TPS, which was repeatedly denied to Haitians by the administration of President George W. Bush, would permit them to work here and send money back home. 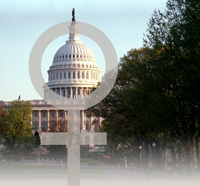 The issue is reportedly under review by Homeland Security Secretary Janet Napolitano. The U.S. is Haiti’s biggest bilateral donor, although Canada, France, and Japan – all of which sent senior officials to Wednesday’s conference – have also provided hundreds of millions of dollars in aid in recent years. Canada’s Minister of International Co-operation, Beverley Oda, announced Tuesday that Ottawa was on track to meet its commitment of 555 million dollars in aid to Haiti over five years, making it the largest per capita bilateral donor. The Haitian government has worked closely with donors in developing a two-year recovery plan designed, among other things, to create 150,000 jobs. Zoellick called for improved co-ordination among the donors, particularly reducing the administrative and accounting burden on Haiti’s weak government bureaucracy, channeling more aid through the national budget, and aligning funding with priority projects. Meeting at the Picnic table: The equivalent of the 3am phone call? Hillary: Obama adviser, Secretary of State, First Lady Adviser, Foreign Policy Chief, Nuclear Arms consultant, Goodwill Ambassador, State of Affairs Analyst etc. Hillary has how many jobs? She’s only getting paid for one, her Secretary of State position and there were complaints about that, she would be over paid. Another busy day at the White House: First Lady Michelle Obama hosted students from Bancroft High School in Washington, who helped her plant and water the brand-new White House garden. She and Agriculture secretary Tom Vilsack spoke to the students about the healthy fruits and veggies that would grow there. “It’s all brain food,” Obama said. She cheered the kids for bringing good weather and then sent them (and the press) home with cookies. 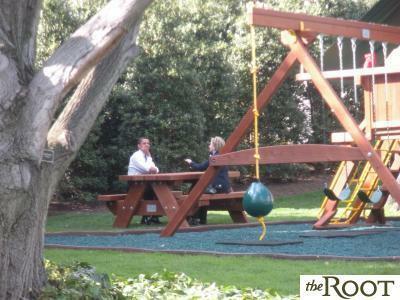 The weather was so nice in fact, that, after President Obama received his economic briefing and met with Defense Secretary Robert Gates in the Oval Office, the POTUS and Secretary of State Hillary Clinton decided to hold their 4:15 meeting out behind the White House—next to the swing set installed for the Obama girls in March. As we look back, Hillary’s assessment (kind as it was ) was more than appropriate and accurate! Thank you very much, Reno, and let me welcome all of you here for this very important event. It’s a real pleasure for me to have the honor of serving as Secretary of State as we celebrate really four interlocking events that bring us all to this place today. I want to certainly welcome all of the ministers who are here and also Prince Albert – we greatly appreciate his work – the many representatives of organizations that have been deeply concerned about the Antarctic and the Arctic. But let me relate the four important events that I think we are marking today: first, the conclusion of the International Polar Year, a coordinated effort in planetary research among scientists from more than 60 nations; second, the start of the Annual Antarctic Treaty Consultative Meeting, which the United States is proud to host for the first time in 30 years; third, the first ever Joint Session of the Antarctic Treaty Consultative Meeting and the Arctic Council; and finally, the 50th anniversary of the treaty itself, which stands as an example of how agreements created for one age can serve the world in another, and how when nations work together at their best the benefits are felt not only by their own people but by all people and by succeeding generations. In 1959, representatives from 12 countries came together in Washington to sign the Antarctic Treaty, which is sometimes referred to as the first arms control agreement of the Cold War. Today, 47 nations have signed it. And as a result, Antarctica is one of the few places on earth where there has never been war. Other than occasional arguments among scientists and those stationed there over weighty matters having to do with sports, entertainment, and science, there has been very little conflict. It is a land where science is the universal language and the highest priority and where people from different regions, races, and religions live and work together in one of the planet’s most remote, beautiful, and dangerous places. The genius of the Antarctic Treaty lies in its relevance today. It was written to meet the challenges of an earlier time, but it and its related instruments remain a key tool in our efforts to address an urgent threat of this time, climate change, which has already destabilized communities on every continent, endangered plant and animal species, and jeopardized critical food and water sources.